A delegation of MPs from Egypt's upper and lower houses of parliament will head to Saudi Arabia Thursday for talks on the case of Ahmed El-Gizawi, the Egyptian lawyer reportedly sentenced to 20 lashes for "defaming the Saudi king," and the resulting protests that led to the temporary closure of the Saudi embassy in Cairo and the recall of the Kingdom's ambassador last week. 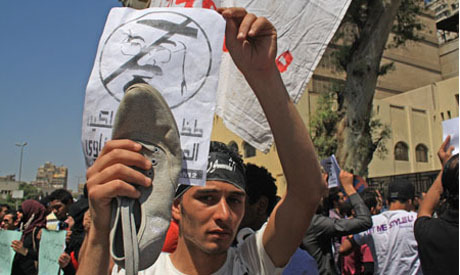 Protesters gathered outside the Kingdom's Cairo embassy to call for El-Gizawi's release and to denounce the mistreatment of Egyptians in the oil-rich country. El-Gizawi was detained for reportedly "defaming the king," after he filed a lawsuit in a Cairo court against the Saudi monarch King Abdullah Bin Abdel-Aziz Al-Saud on behalf of Egyptians currently languishing in the Kingdom's prisons without charge. Saudi officials have denied that El-Gizawi was sentenced to a one-year jail term and 20 lashes, stating that he was arrested after being found in possession of more than 21,000 pills of the anti-depressant drug, Xanax, trade in which is proscribed in the Kingdom.